While I was in a Japanese hospital fighting my first lupus flare, I discovered the 2006 installation Head On by Chinese artist Cai Guo-Qiang, in which ninety-nine wolves— constructed of metal wires, sheepskin, and hay, but marvelously lifelike—barrel through space. Looking at a photograph online, I caught my breath. In it, the beast of our fairy tales, our historical reality (one of Hitler’s nicknames was “Herr Wolf”), and my body is splintered into the many contortions of a predator. Into the movement of life itself, which dictates that even the strongest and fiercest among us rush toward their ends. In the midst of trying to coax my own immune system into gentleness, I stared at a pack of wolves coming undone, made of the skin of their prey, and smiled to think that we’re vulnerable even when we attack. Months later, I went into remission. This was the second remission of my life. The first, about five years back, occurred when I found peace and stability after struggling for decades with major depression, anxiety, suicide attempts, obsessive-compulsive disorder, substance abuse, and possibly borderline personality disorder. The word remission comes from Old French, meaning “forgiveness or pardon of sins.” In modern usage, it can either retain this original meaning, refer to the transmission of a payment, or denote the abatement of some activity or feeling. And of course, in medical terms, remission means that an illness or its manifestations have either temporarily or permanently subsided (an essential difference, yet the same word is used for both). In Japanese, the word for medical remission is kankai. The first kanji, kan, signifies tolerance or forbearance, while the second kanji, kai, is used in words related to loosening, understanding, and salvation. In both languages, then, there is a spiritual/ethical dimension to this word that is most commonly used in the context of sickness. If I apply the word remission to my own case, two years after my diagnosis of lupus, I am consciously playing on the medical, financial, and ethical valences all at once. I feel strong, both physically and emotionally. In terms of finances, when I did the tally, the cost of my various treatments for lupus and mental illness—including hospitalizations, decades of therapy and medications, and the bill for saving my life after I was brutally attacked by a schizophrenic patient in a psych ward—came to well over half a million dollars. Because I was fortunate enough to have health insurance during most of the time I lived in the United States, the amount that my caretakers and I were responsible for comprised only about a third of that amount. Still, it wasn’t cheap for my middle-class family when I was growing up, and it hasn’t felt cheap since. This is why, shortly after I was diagnosed with lupus, my husband and I decided to move permanently to his home country of Canada. We did so in September 2017, and a year later, I became a permanent resident. I am extraordinarily lucky to have this option. Yet I don’t know, at this point in my life, if I’ve paid in full for my physical and mental disorders, or for the not-so-nice ways I treated people under the influence of the latter. Or perhaps I am being paid back for something within my illnesses and their treatments. That word, remission, embodies my dilemma, the way in which the idea and reality of my disorders, and the power dynamics and high costs involved in their cures, have troubled and will continue to trouble the contours of my life. We can’t recover from any kind of illness by will alone. But sometimes it is possible to recover for a time. In the course of my protracted psychotherapy and hospitalizations, I’d forgotten that possibility. Getting physically sick, it turns out, taught me a great deal about healing from mental illness. Maybe, as a last resort, one category of ailment may cancel out the other, like a double negative in a lifelong sentence. Or maybe I just have to learn to find wonder in the processes of healing, which may never end. Whether troubled by physical or mental maladies, the chronically ill will only be seen as whole and blameless people once it’s universally acknowledged that all fields of medicine, and particularly those of mental health, are fallible and culturally conditioned; that medical treatments can themselves be humiliating and hurtful, not to mention of variable effectiveness; that people with diseases do not choose to have them; and that people heal as serendipitously as they fall sick. Embracing that last principle would have profound implications for patients in the United States, where a pre-existing condition on a chart can effectively ruin a person’s access to reasonably priced care—in other words, ruin a person’s life. All of us have the potential to get sick at any moment but also the potential to get well. 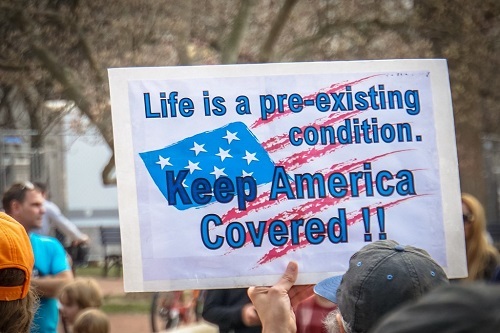 The term “pre-existing condition” is meaningless, a sick invention of insurance companies. The citizens of countries like Japan and Canada, which are canopied by universal health care systems, only encounter this term when applying for supplementary insurance, usually for travel abroad. In the human body and the halls of medical science alike, health is not a stable construct. Health is a story we tell ourselves and others tell to us, but it changes over time. Given the increased attention to intersectionality in today’s culture, we should know to undertake its reading and consider its authors with great care. After years of treatment that aligned recovery with compliance, I’m claiming my story and my cure in my own words. While I regret pain I have experienced or caused, I’m not ashamed of my illnesses. For a long time, I was. But getting diagnosed with a chronic physical illness has assured me that sickness doesn’t in itself suggest culpability. It suggests the luck of the draw; it suggests change; it suggests what it means to be vulnerable and thus to be human. What we do once we’re sick—well, that is up to us, for better or worse. Like the wolves in Head On, each one of us is wending our way toward death. While illness may seem senseless, especially when one is newly stricken, it’s actually one of the most natural things in the world. As Paul Kalanithi pointed out in When Breath Becomes Air, a memoir he wrote shortly before he died of lung cancer and after he’d spent over a decade mastering neurosurgery to cure others, the question is not Why me? but Why not me? Recently, I found out that one of my maternal aunts was being tested for lupus. The niece of a great-aunt who died of scleroderma, this aunt would have been the direct link that connected me, through autoimmune disease, to a woman who died before I could ever meet her. Even as I wished this tentative diagnosis for her would prove to be a false alarm—and eventually, it did—I realized that disease reinforces your identity as part of a tainted tribe as much as it singles you out for ill treatment. I had been looking all my life for true family, and after decades of feeling like sickness kept me apart, a new one at last delivered me to it: belonging. Once scientists have succeeded in eradicating all diseases, our understanding of our lives—and indeed of time, language, ethics, and many other things—will be radically altered. Until then, we must make room for the compromises, feints, hardships, and obscure pleasures of acute sicknesses, pernicious cures, and uncertain remissions. Just as diagnoses bloomed and withered throughout the twentieth century’s changing seasons, diagnoses appear, morph, and vanish throughout individual lives. In an era that is increasingly celebrating the fluidity of gender and sexuality, perhaps this fluidity of physical and mental health can also become part of accepted mores, greeted with compassion, a sense of humor, and a soupcon of creativity, instead of remaining a taboo subject—among the last—that is viewed solely in terms of physical, emotional, financial, and social liability. It goes without saying that this will only be possible once everyone in the United States—indeed, everyone in the world—has guaranteed access to competent, affordable health care. I pray that I’ll see the day when we all go into remission from the madness of pre-existing conditions. I am the author of The Floating World, a novel published by Ballantine, and The Demimonde in Japanese Literature: Sexuality and the Literary Karyukai, an academic monograph from Cambria Press. I have had work published in Salon, Electric Literature, The Mississippi Review, Entropy, B O D Y, and The Ekphrastic Review. This essay is excerpted from Chronic: Blame, Bodies, and Decades of Madness, a memoir/cultural theory book that my agent is currently submitting to publishers.